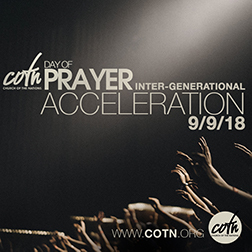 As you know the Day of Prayer is the only event each year where we ask every COTN Church, associated ministries/organisations and individuals to be part of. It's Tony’s heart and that of the entire Apostolic Council that with one accord in unity that we stand in prayer before the Father, both to hear His voice and implore His favour. This year as you know our theme is ACCELERATION. We ask that you allow ample time on September 9 to embrace this moment with fellow believers across the world. You will be receiving slides and notes relating to the Prayer Points within in the next week. Expectant for the unexpected - ONLY 2 WEEKS AWAY! CLICK HERE TO GO TO THE DAY PRAYER RESOURCES.